I gave a little talk last night at the SciBar in London. It was a lot of fun and hope people enjoyed it! I’d recommend that you go along to one of their future events. So I was talking about some of my current research on future storminess. This was kind of based on a post I wrote for the Nature Soapbox Science blog a few months ago (and then re-posted here). One of the issues with looking at convective storms, or thunderstorms, in computer climate models is the resolution of the model i.e. the size of the boxes that the model splits the atmosphere up into. Ideally you’d have very small boxes so that you can “build” the storms in the model. But that isn’t possible given current computing power. To demonstrate the importance of this at the SciBar I brought along some lego, duplo and a cube and asked people to make the best storm they could (see picture). I hope that this worked! What do other people think about this method of explaining the effect of model resolution? I guess someone’s used it before but I quite liked it all the same. Well, there’s a bit of a buzz about lenticular clouds at the moment as there were some wonderful photos taken of a lenticular cloud in West Yorkshire yesterday. 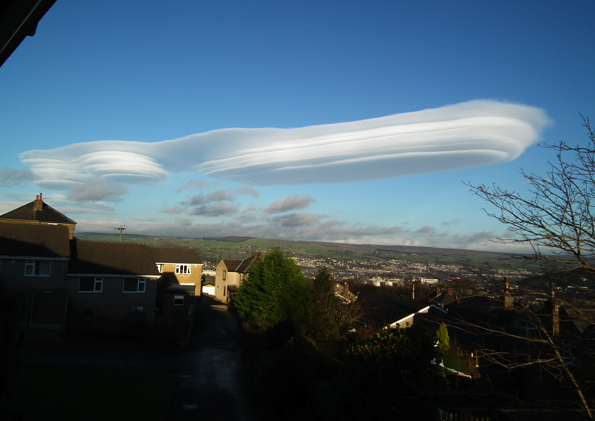 Lenticular cloud in West Yorkshire on 22/12/2011. Photo from Paul Hudson's blog. These crisp and layered lenticular cloud are relatively rare in the UK as they form downwind of mountains or hills. 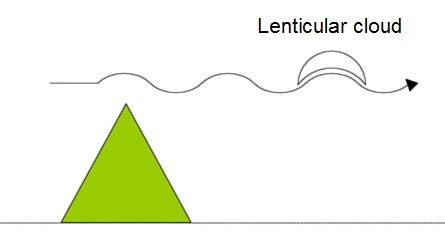 What happens is that the air flowing over the hill gets “knocked” upwards which results in a type of wave forming. The cloud forms on this wave at a point where the flowing air moves upwards and cools to a point where the water vapour condenses into a cloud. So, although the cloud is stationary, there is a constant flow of air going through it. Quick sketch of lenticular cloud formation. I’ve been pretty distracted recently with the Institute of Physics issue. I’ll hopefully draw that chapter to a close in the next couple of weeks (it looks like the IoP are going to stick their head in the sand and wait for it to blow over) but right now I’m bringing my current project to a close so I thought I’d look at how that work has gone and where it’ll go in the future. The work I’ve been doing at Manchester over the last few years is looking at how storms form – the kind of storms that lead to floods like the one seen in Boscastle in 2004. These type of storms are pretty difficult to forecast because they are often smaller than the computer model grid box size that such models use to chunk up the atmosphere into a more manageable mathematical problem. I spoke about this in a recent edition of the NERC Planet Earth podcast. I’ve been part of a couple of big projects that try and observe these storms as they form. We do this by getting big teams of scientists, around 50 or so, to go to a certain location for a few months and then use surface stations, aeroplanes, weather balloons, radar, lidar and satellite data to get a really good picture of what’s going on. The video below shows the Chilbolton radar scanning convective clouds as they develop whilst someone launches weather balloons in the bottom left hand corner – this is pretty typical of what goes on at several locations during these campaigns, although this is the biggest dish we’ve used. I’ve only been looking at a small part of the storm problem: how does air that descends from the stratosphere influence these storms? 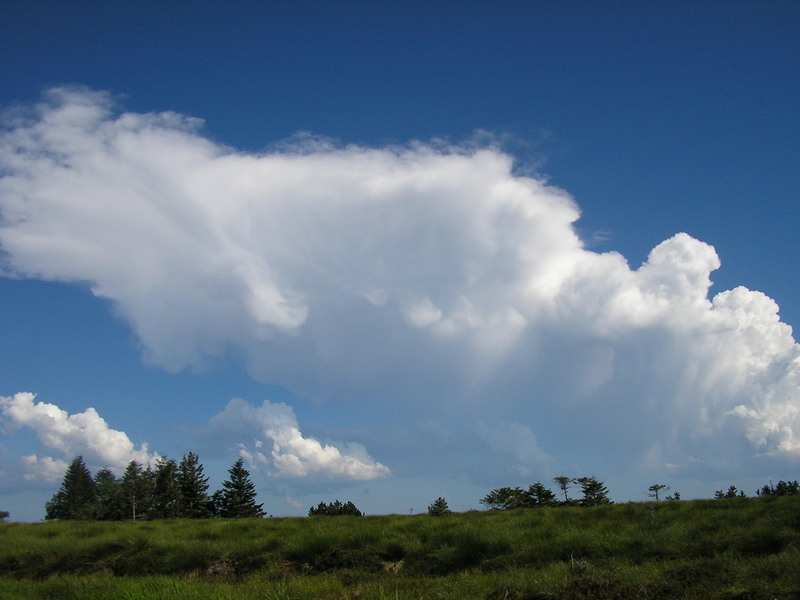 I’ve shown that this upper-level air can sometimes make storms less likely by introducing thin layers into the atmosphere that can cap storms before they get going (Russell et al., 2008) and sometimes make storms more likely by changing the temperature structure of the atmosphere to make the convection more powerful (Russell et al., 2009). That doesn’t sound much like progress, does it? Well, now that we know a lot more about these two types of effect, we can start to generalise them and use that knowledge to help forecasters improve their predictions and computer models. This is what we are working on now. So how does climate change fit in to all this? The next big step in this work is to try and define a “storm environment”, including what we now know about these upper-level features, and apply this to the kind of projections that climate models produce. These projections use even bigger grid boxes than weather models so this step will not be easy but if we can show that this method works using the data that is available now (and hope for better resolution soon) then we can start to think about the likely changes in this storm environment. These big storms can really affect people’s lives so this type of work is something that would influence how we start to prepare for the future. 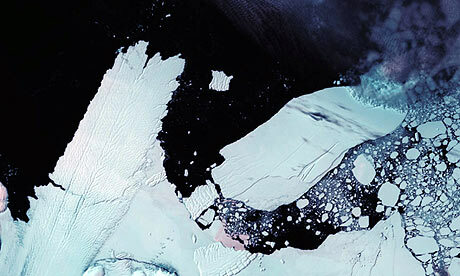 Antarctic climate change – the exception that proves the rule? Antarctica has been in the news recently because two large icebergs (one about 60 miles long and the other about 50) have broken off the continent. These “calving” events often occur naturally and these ones are probably not linked to climate change, although they might affect the global ocean circulation. The clearest signal is rapid warming that has been seen on the Antarctic Peninsula (the bit that points up to South America) over the last 50 years. The picture for the rest of the continent is not so clear, mainly because of the lack of data. For comparison, the USA has over 1000 climatological observing stations, some of which go back to the late 1800s; Antarctica currently has around 55 stations, very few of which go back to before 1957, (plus a similar number of automatic weather stations, which tend to not be maintained for long periods) and these data are used to represent a much bigger land area. Nonetheless, there have been some high profile studies looking at Antarctic temperature trends, some finding cooling, some finding warming and nearly all being controversial. So why is the warming on the Peninsula so clear? The reason is that the warming is mostly driven by atmospheric circulation changes and not the increase in the greenhouse gas concentrations (although global climate change patterns forced by GHGs can include atmospheric circulation changes). The key factor is that the ozone hole above the South Pole has changed the wind patterns – when ozone is removed from the stratosphere, less solar UV radiation is absorbed so the polar stratosphere cools. This increases the temperature change as you move away from the pole and, in turn, has changed the westerly (clockwise) winds that circle the pole – they are now further south and faster. This wind pattern spreads down through the atmosphere towards the planet’s surface and has, therefore, brought more warm air from over the Southern Ocean to the Peninsula. This circulation change has less effect on the Antarctic interior and possibly even isolates it from the rest of the Earth system. This climate change pattern is really interesting to study and we can even use ice core data from the Antarctic to look at how these winds have changed in the past – I’ve recently reviewed the literature on this subject (Russell and McGregor 2010). Korhonen et al. (2010) have even found another mechanism of how these wind changes have affected the climate. As the wind speed over the ocean increases, it throws up more spray and this means that more clouds can form over the Southern Ocean and Antarctica (I’ll write a post later about how clouds form). If there are more, bright clouds around then these reflect away more incoming sunlight, which will cool the region beneath these clouds. 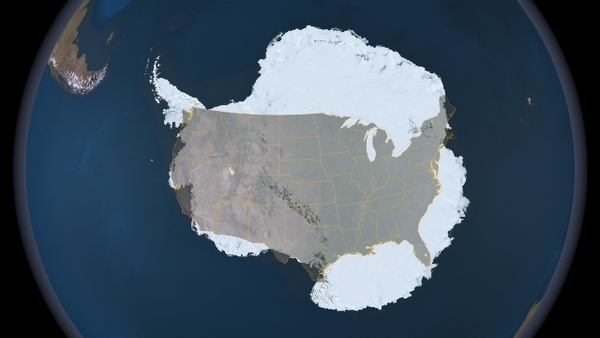 So, to bring all this together, if the Antarctic continent has been cooling (which isn’t clear) then this could be because the normal rules don’t apply to Antarctica. Does this mean that we can say that Antarctic climate change is the exception that proves the rule of GHG forced climate change? Probably not, but it does highlight just how complicated the climate system is and how much more there is find out about it! I'm a Senior Lecturer in Climate Change working at Brunel University in London. I investigate European extreme events and Antarctic climate change. I am Programme Director for our BSc in Environmental Sciences and our MSc in Climate Change and Sustainability. This blog charts my reactions to news stories on weather and climate and why I love atmospheric science. Electoral reform in the UK?